This 14k Two-Tone white with rose gold handmade piece of nautical statement jewelry features a vintage-inspired design and was polished to perfection by our best jewelry makers. Exhibit your sharp and scintillating style in the classiest of ways with this ship rudder pendant necklace. Individually hand polished to a lasting high sheen polish finish. This pendant is both of unsurpassed quality and impressive design. This fine pendant features ship's steering wheel/helm and is an excellent gift for who appreciates the nautical themes. 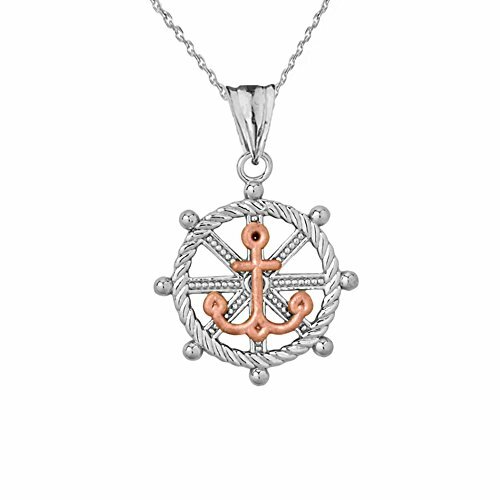 A well-detailed rope-style ship's rudder with an anchor on top charm pendant dangling from its dainty yet durable gold chain necklace that's exquisitely crafted with authentic 14 karat white and rose gold in perfect polished finish. comes with free special gift packaging perfect for Anniversary, Birthday, Valentines day, Graduation, or any occasions for son, daughter, husband, wife, etc. or for one's self. If you have any questions about this product by Sea Life Collection, contact us by completing and submitting the form below. If you are looking for a specif part number, please include it with your message.